"We said from the very start that this notorious commission of Mr. Mueller wouldn’t find anything because we know this better than anyone,” Putin told the International Arctic Forum in St. Petersburg on Tuesday, adding that it was "utter nonsense aimed solely at a domestic audience and used for internal political struggle in the U.S."
As a reminder, Trump scored the biggest political victory of his presidency - even as the credibility of the US liberal medial plumbed new lows - last month after AG William Barr published a summary of Mueller’s finding that there was no collusion during the campaign. Trump, who repeatedly - and correctly - condemned the 22-month inquiry as a "witch hunt" said he’d been completely exonerated. Agreeing with his US colleague, Putin said that witch hunts are "a black page" in U.S. history and "I would not like it ever to happen again" (here the conspiracy nuts should be ready to chime in with a witty rejoinder). The outcome of the Mueller investigation showed that “a mountain gave birth to a mouse,” the Russian president said. While Putin said when the two leaders met in Helsinki last year that he’d wanted Trump to win the 2016 election because of his pledge to improve relations - and because Hillary Clinton's State Department did everything in its power to set the stage for a war between Russia and Ukraine - he avoided generating more controversy, and said he supports Trump's re-election in 2020. "We respect the wishes of the American people,” he said. "Whoever is president, we’re ready to work with them." To be sure, much bad blood remains between the US "deep state" and Moscow: recall that US intelligence agencies "concluded" that Russia was behind hacking aimed at damaging Democratic Party contender Hillary Clinton (which unveiled that the DNC had rigged the primaries against Bernie Sanders, and that Hillary Clinton was a professional in saying one thing to the public and something else to Wall Street). Russia, naturally, rejects the allegations. Trump pledged during his campaign to improve ties with Russia and has repeatedly said he wants good relations with Putin. As for how the former KGB spy and Trump are getting along currently, Putin said he has "plenty of disagreements" with Trump, whose administration has imposed a series of new sanctions on his country, but is ready to work with the U.S. on issues of joint interest including terrorism and arms control. 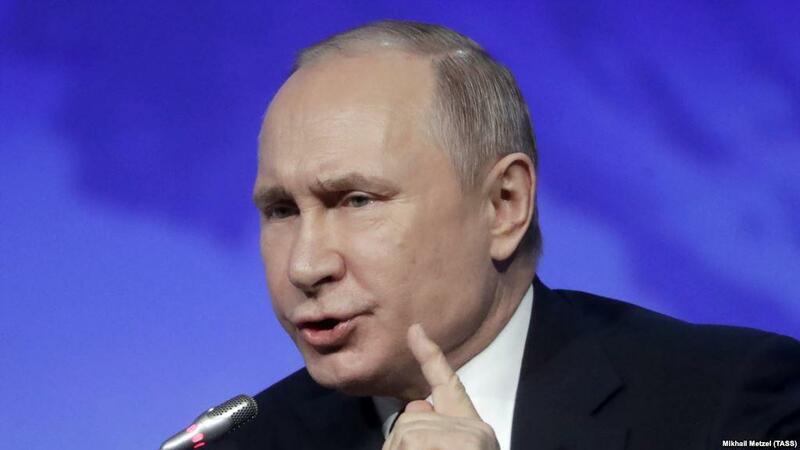 Separately, Putin also said that Russia will dramatically increase its presence in the Arctic region by building new ports and other facilities and expanding its fleet of icebreaker vessels, as the competition for the area's natural resources intensifies. Putin told the leaders of Finland, Iceland, Norway, and Sweden at the Forum that Russia's efforts will help quadruple the level of cargo shipments across the Arctic sea route. And here is another irony: climate change is directly benefiting Russia - the shrinking polar ice in the Arctic region is expected to offer new opportunities for resource exploration and the development of new shipping lanes, leading Russia, the United States, Canada, Denmark, and Norway into a competition for jurisdiction in the region. In 2017, Jim Mattis, the former U.S. defense secretary noted the Russian buildup and said that "America has got to up its game in the Arctic."